After receiving a plethora of Easter candy from relatives, neighbors, friends, and the Easter Bunny, it’s easy to understand how one might wish to never see a jelly bean, Peep™, or chocolate again. You may be even thinking of tossing those plastic eggs. Have some chocolate without the guilt. Gotchocolate.com has a good tutorial. Tidymom.net offers a strawberry cake ball recipe covered with melted chocolate. Any candy can be added to a cookie. Image courtesy of Parsley on Food.com’s recipe M & M cookies. Sallysbakingaddiction.com offers a recipe on Reeses Pieces Blondie Bars. Peeps now have a place around the campfire with Bakedbee.com’s image/idea of Peep s’mores. Peeps can be transformed into play dough and fondant. Image/directions courtesy of Max Resdefault on YouTube. Don’t forget those little candies and jelly beans can also come in handy the next time you’re make gingerbread houses. 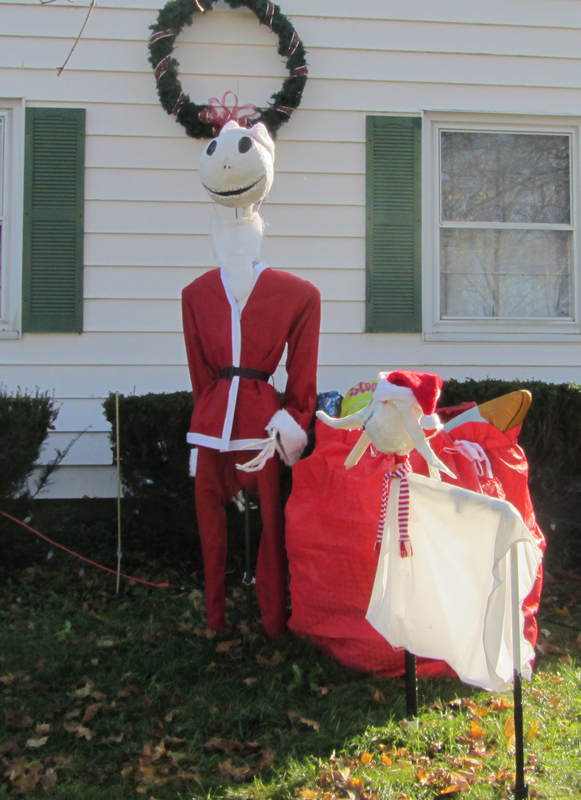 Do you have an idea you’d like to share on re-using your holiday bounty? We’d love to hear it! A quick and easy tip for those struggling to get every pumpkin lit. 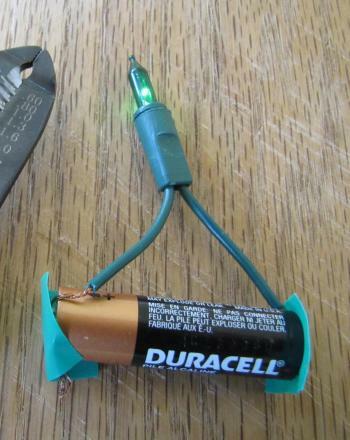 Education.com offers a tutorial on how to turn one light bulb from a broken strand into a battery-operated one for a prop. I’m gonna have to try this. If you do before I get the chance, shoot me an email and maybe a pic of how you used a single light. Thanks! I often make at least one new large Halloween prop a year. But there is often a sadness that occurs when I place my artistic endeavors in storage; especially since many times it had taken weeks to create. This was the case a few years ago with my 16 foot pirate ship made from wood pallets. 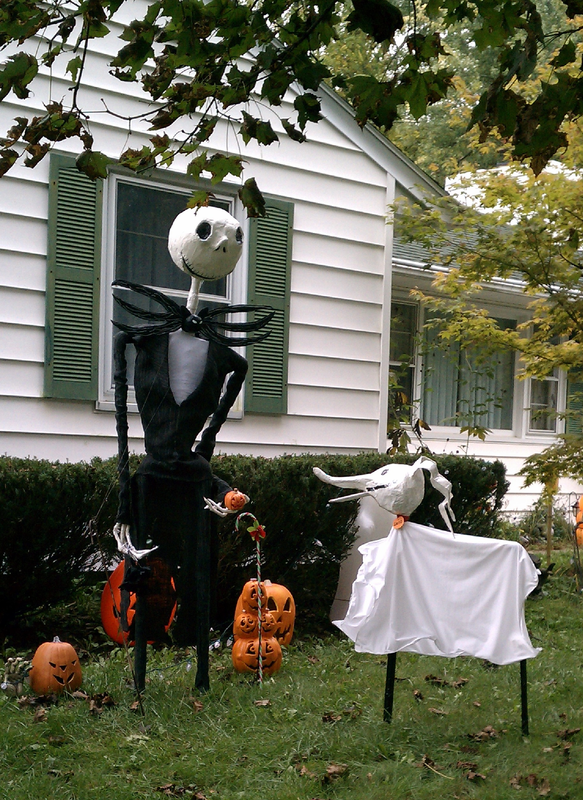 The week after Halloween passed I didn’t have the heart to tear it down. So I turned it into a Santa ship and took Davy Jones away. 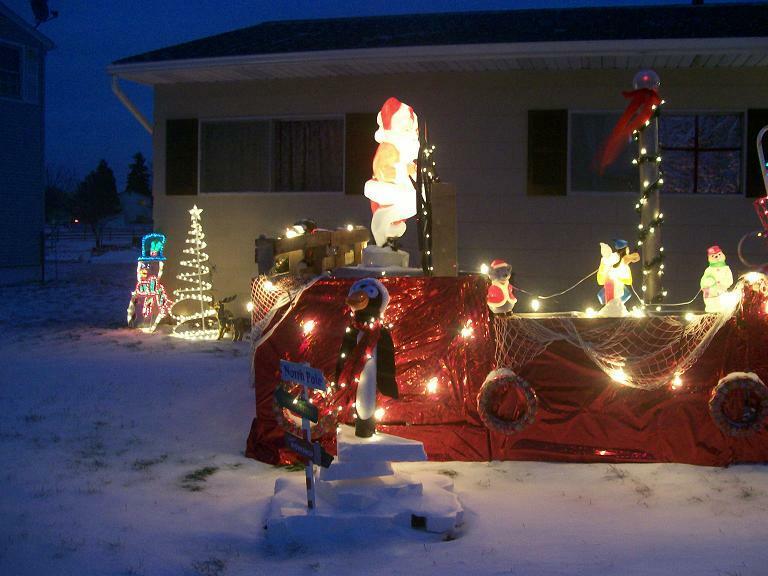 I filled the ship with an enormous bag of toys with Santa at the wheel. 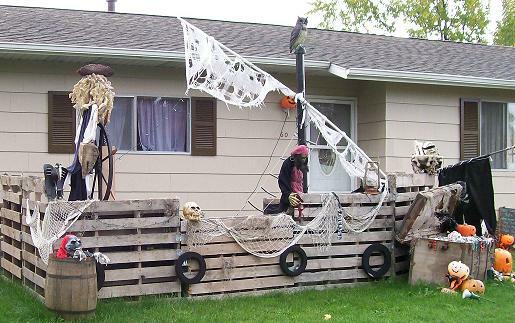 A Halloween pirate ship before transformation. Photos courtesy of Debbie Morrow. From pirate ship to Santa ship with the help of waterproof holographic paper and a little imagination. The Ring girl well made from 40+ stones cast from plaster. 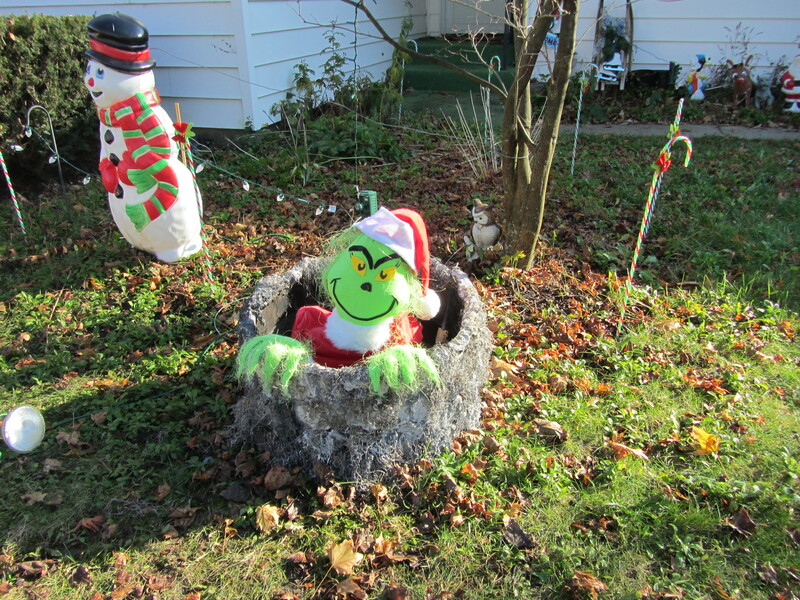 My Grinch now poking his head out of the well. Jack and his dog Zero at Halloween. Jack’s transformation into his Santa suit. I added a scarf and hat to Zero too. Another cool project to make out of recycling books. Photo courtesy of Jean Knox at Instructables. When I ran across a photo of a pumpkin made from a book at My Sublime Blog without a tutorial, I knew I had to take the time to track it down. I found the directions at Creations by Kara and one even more in-depth at Crafting Mom. 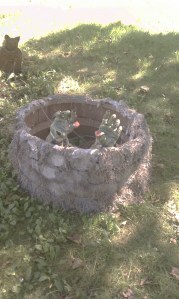 The photo which compelled me to begin the search can be found on the post Awesome DIY Projects I Can’t Wait to Try. 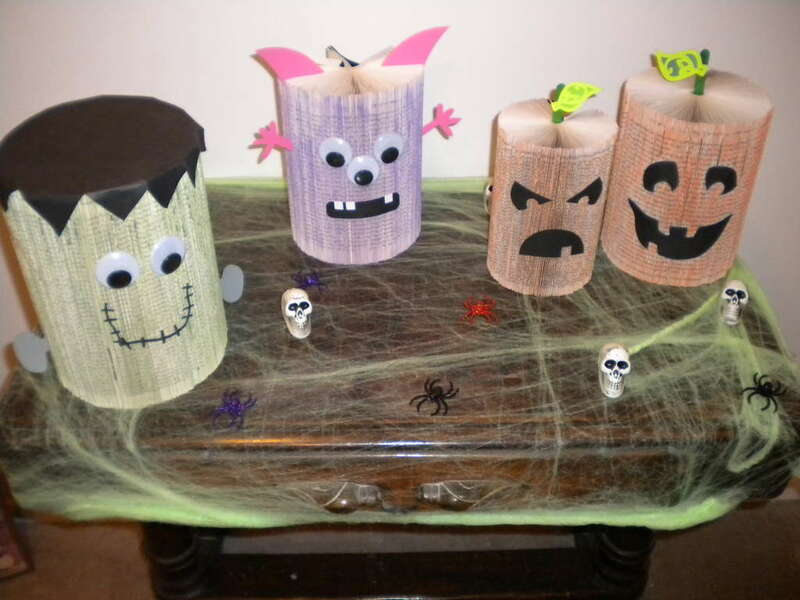 While searching, I also ran across some other great ideas for recycling books such as making a wreath out of old sheet music books or phone books. At Studenthacks.org they show ten great ways to repurpose old books into things such as lampshades, iPod cases, and tell you where to trade them or give them away. It is suggested that before you begin to cut up or give away that old book, you might want to check the value of it at Bookfinder.com.